To start measuring customer dwell ti me, all that needs to be done is to create a zone in the intuitive web based Vector 4D set up interface. Zones work like count lines, however instead of counting when people pass through them, they count when people are within them. The image on the right shows the count zone set up next to the Irisys office reception desk. As detailed in the Introducing Vector 4D post, the Vector 4D uses a Time of Flight sensor to detect invisible infrared light that has been reflected off people passing beneath it and can accurately identify when there is a person present. It can do so even in tough lighting conditions such as bright sunshine and darkness. Privacy is also protected as the sensor only sees the infrared image and no individuals can be identified. The camera on the device is only for setup and audit purposes. 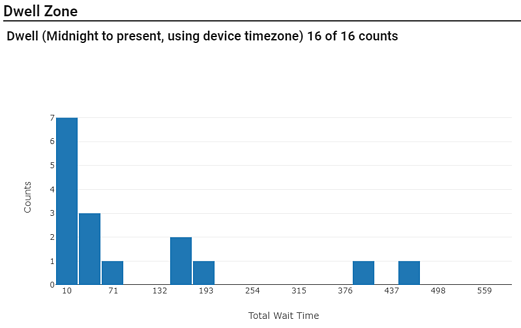 Once the dwell data has been captured, the system stores it and is able to create histogram charts that show the distribution of time spent in the zone. The chart above shows the dwell time distribution for today from the Vector 4D installed in our office’s reception. In retail, product displays and advertisements can have huge impact on sales. Gondola end displays are known to increase sales by up 160% (Shop! Association – POP Compliance) so it is important that this valuable space is used effectively. How many customers walked past the display? Average length of engagement with display – did the customers engage long enough to take on the message you were trying to send? Using this data you can now objectively benchmark or A/B test displays, product placements and store layouts. 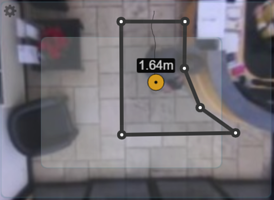 By combining the advance employee detection functionality and dwell measurement capabilities of the Vector 4D, it is possible to truly go beyond people counting and measure customer and staff interactions, automate calls for cleaning or maintenance staff, and even trigger attendance calls for staff when customers are waiting. Each of these will be discussed in future blog posts in this series.